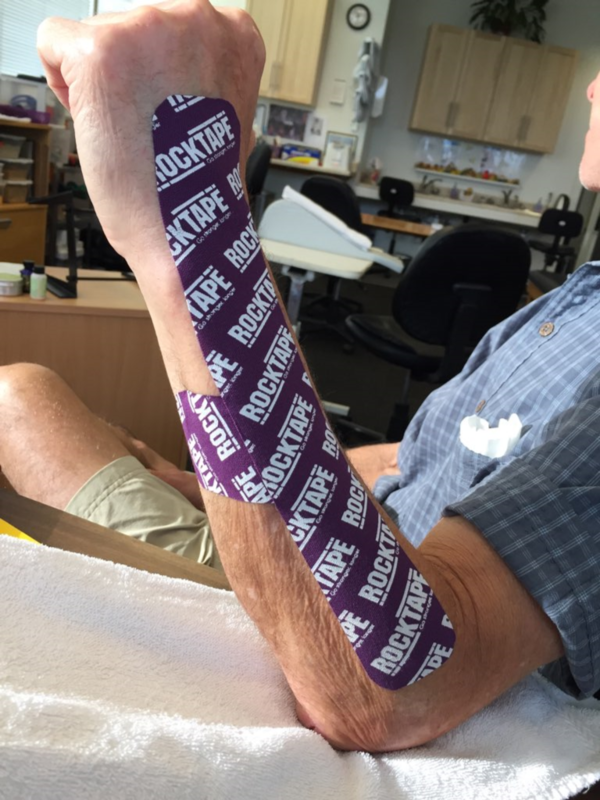 Kinesio taping has been used in conjunction with manual therapy for over thirty years. It was developed by Dr. Kenzo Kase in the 1970s to compliment manual treatment, facilitate the natural healing process, and ultimately prolong the effects of treatment. 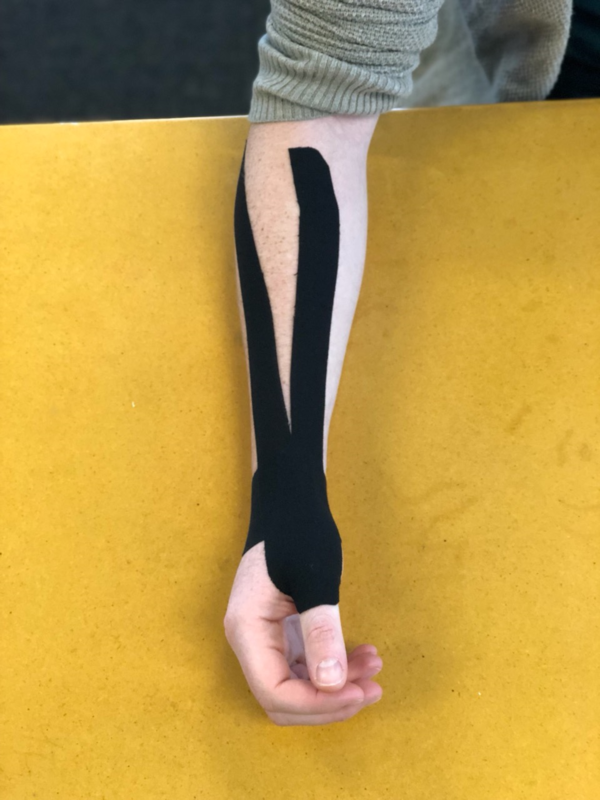 Pain Mitigation—Following the premise of the gate control theory, taping provides localized sensory input that can interfere with pain signals to decrease overall perception of pain. 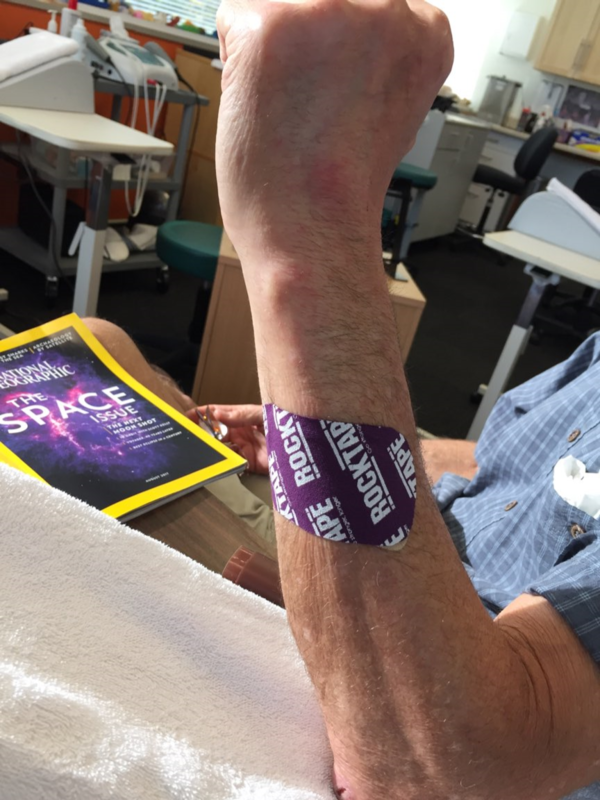 Decompression –Taping has been shown to lift the skin from the underlying tissues, which can increase circulation to the taped area to decrease swelling and improve performance and recovery (see Figure 1). Decompression also assists to alleviate pressure on the free nerve endings responsible for pain perception, thereby reducing pain signals (see Figure 2). Sensory Input—Taping provides input to the sensory nerves under the skin, including receptors responsible for proprioception. Increased proprioceptive input can improve the body’s awareness of itself as it moves through space. Scar Management—Tape strategically placed so that it pulls tissue in the direction of the motion restriction which assists to create a micro massage and shear effect to the scar tissue. This encourages motion and promotes alignment of the tissue with adjacent tissue (see Figure 3). Taping has multiple and overlapping therapeutic benefits! Decompression taping for rotator cuff tendonitis. De Quervain’s decompression taping for pain and swelling. Scar modeling achieved by placing silicone scar pad under 1st tape strip. Scar management taping for extensor tendon laceration. 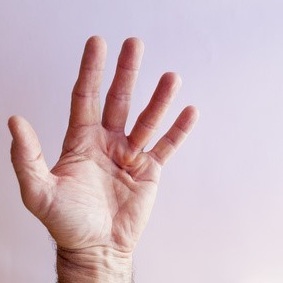 Dupuytren’s Contracture is an abnormal thickening and shortening of tissue in the palm. It most commonly affects the ring and little fingers and is found most often in men over the age of 50 whom are of Northern European descent. Rehabilitation for Dupuytren’s contracture varies according to method of release. Following non-operative procedures patients are typically treated for 4 visits to develop a home program for symptom control, range of motion, and custom retainer splinting. Following surgical correction, patients are typically treated for 6-12 visits. Post surgical rehab often requires the need for wound care, modalities for management of more significant edema and pain, as well as soft tissue work to improve mobility. Since 2010, radiation therapy has been trialed for contracture prevention and maintenance. It is theorized that radiation slows fibroblast development and growth rate, thus delaying the need for surgical management. The goal, following all methods is the return of mobility, strength, and maximum functional use. Radiation Therapy: Retainer splinting and exercise if motion is reduced. Collagenase Injection: Retainer splinting, edema control, & exercise as needed. Needle Aponeurotomy: Edema control, retainer splinting and exercise. Open Fasciotomy: wound/graft care, edema/pain control, scar management, retainer splinting and exercise. 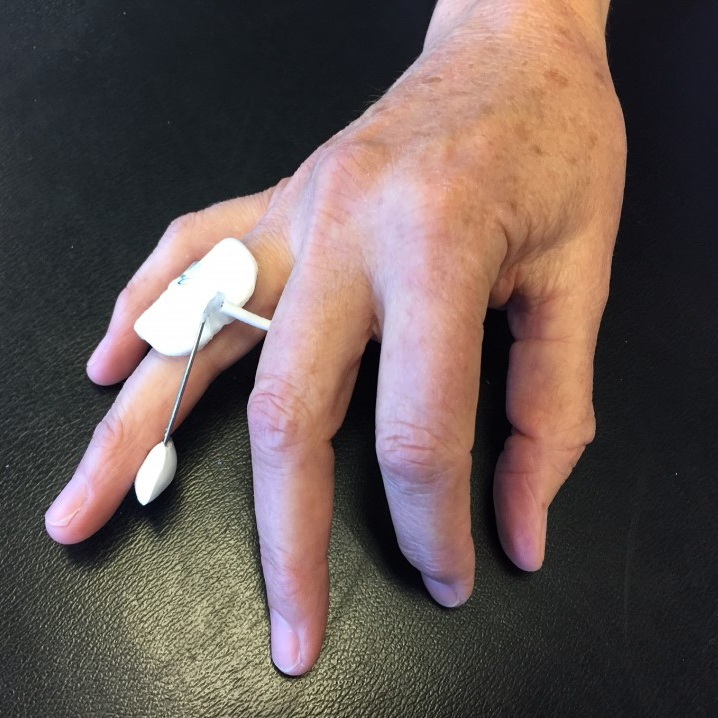 Custom hand or ﬁnger based digital retainer splint to maintain extension gained from procedure. Eccentric strengthening lengthens the muscle while being loaded and contracted. This helps to stimulate collagen production & alignment while improving tensile strength. For the treatment of lateral epicondylitis (commonly known as tennis elbow), it is important to distinguish between tendinitis and tendinosis. Tendinitis is inflammation of the tendon that is the result of small tears that occur from sudden or excessive force. Tendinosis is a breakdown of the tendon’s collagen with repetitive overuse and comes with age. Although cellular damage cannot be reversed completely, hands on treatment and eccentric strengthening combined with self-care routines can increase the strength of the tendon and promote the production of healthy collagen to the area. Proper treatment should significantly decrease pain, increase tensile strength, and ultimately allow the patient to return to normal daily activities. Poor posture can be the root cause for many upper extremity pain problems. Treating postural imbalance is often necessary for resolving these issues. Diagnoses such as tendonitis/tendinosis, proximal and distal nerve compression, functional shoulder impingement, or circulation problems, for example, may be helped by postural stretching. Studies show that good posture is beneficial for the overall improvement of any upper extremity injury. Upper quarter mobility, stretching, and aerobic exercises are valuable for stimulating lymphatic flow and promoting circulation to all upper extremity structures. We provide both on-site ergonomic work evaluations and travel to client’s work site to perform evaluations. We can recommend changes for set-ups with proper chair heights, keyboard and mouse positioning, and incorporate stretching exercises to prevent development of injuries or reduce current injury symptoms. We address other ergonomic needs of the patients for injury prevention with instruction in task modification i.e., adaptive writing pens, changes in garden or work tool ergonomic designs. See a printable PDF here.